To celebrate our newest Monster Family member, Frederick the Beetle by Bwana Spoons, we are throwing a little get together, Frederick Fest!, this Saturday, March 24th at 11AM Pacific at the Super7 Store. Bwana will be on hand in person to party it up with some original art, hand-painted customs and fun party games. So mark your calendars now and stop by to check out the debut release of the Fields of Green Frederick the Beetle and party it up with Bwana. 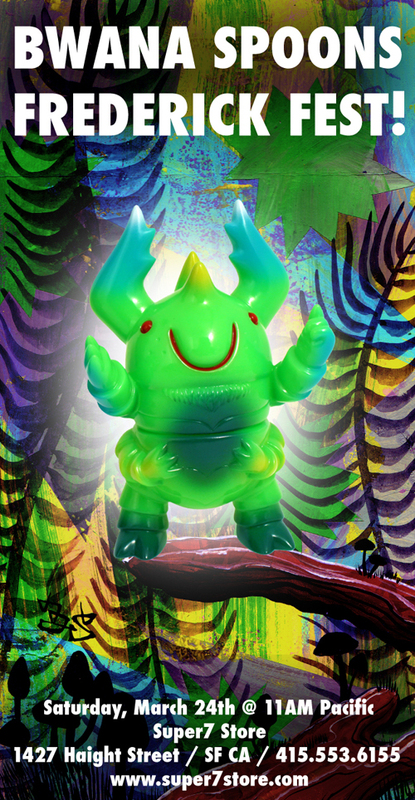 All smiles and giving away free hugs, Bwana Spoons's Frederick the Beetle is cast in Green vinyl with Blue, Dark Green, White, Yellow and Red sprays. $35 each.